The forecast yesterday was for a 70% chance of high squirrel activity, with a strong likelihood of bunny shenanigans in the afternoon. As such, Shaak Ti was on high alert all day. "I see you out there Mr. Squirrel". This couch is out on the front porch and is the only piece of furniture that the dogs are allowed on. Shaak Ti makes the most of this whenever we're out on the front porch and spends time staring out the window, napping, or snuggling with Alycia. 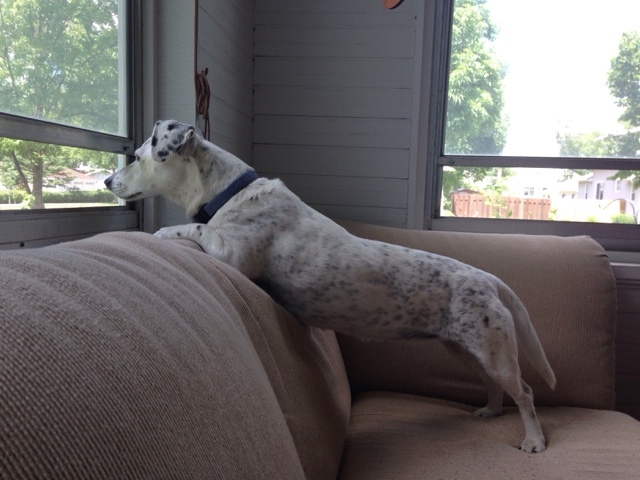 The squirrels and rabbits must not even dare venture into your yard with such good watchers on duty! Karen - They still do occasionally. We've come to understand that some of the varmints are smarter than others.